This blog showcases stories from my family history research, and is a place to share my journey as a new genealogist in a world where so much is available on line. My lines lead to Canada mainly from England and the United States, but also from Ireland, Germany and France. Some surnames I will be writing about are Saunders, Sanderson, Hart, Merriam, Wright, Marlow, Bosomworth, Monk, Crawford, Lefevre, Green, Cook, Goff, and Dickenson. I wrote about the Goff and Saunders families early on in this blog with my four part series on my great grandfather, Herbert Charles Saunders. In these posts, I told the story of Herbert’s parents, and the effect the loss of his mother, Mary Jane Goff, had on his father, James Saunders, and all the events to which this led. This included my great grandfather being sent to Canada as a British Home Child. I have recently found some revealing articles in the British press from the nineteenth century which have helped to shed more light on these families, particularly the Goffs. Or should I say, “Goff or Newbery”. I am not joking. The actual surname of the family for at least about two hundred years and likely longer, was all three words, “Goff or Newbery”. I had never come across such a thing before, and as yet I cannot explain why two surnames were linked in such a way. It appears that other researchers are as baffled as I am. (In addition, Goff is often written as Gough). When I research my direct ancestors, I often find more about their siblings than I do about them, and this is the case with Mary Jane and her family. I was able to find more about her parents, her brother Thomas, and her sister Phoebe. I would like to focus on Phoebe today, as her story reads as if it came out of the pages of Charles Dickens or Victor Hugo. She also played an important role in the lives of the James Saunders family, and my great grandfather most certainly would have known her. Phoebe and Mary Jane were born to George Goff or Newbery, who was born March 22, 1809 in Stockland, Dorset, and Ann Farrant, born about 1816 in Shute, Devon. (Ordering Mary Jane’s birth record from the General Record Office allowed me to identify her parents). George and Ann were married on June 13, 1837 in Shute, a few months before civil registration began in England. Their children, all born in Stockland after it became part of Devon, where the couple lived until George’s death, were Phoebe, born about 1845, Thomas born 1847, Elizabeth Ann born about 1849, Mary Jane born February 21, 1851, and James born 1857. (Not all of the children’s births seem to have been registered). Interestingly, only Thomas seemed to use the name Newbery as his surname or part of his surname, and George often used only Goff. There may be additional children as there are no births identified between the marriage date and Phoebe’s birth eight years later. However, the couple is childless in the 1841 census. George’s occupation was variously described as “labourer”, “agricultural labourer”, and worker in a brewery. It appears that George Goff or Newbery ran afoul of the law in his life, usually being accused of theft of food items. It appears that he was imprisoned in 1835 at the age of twenty-six for three months for having stolen “flour”. During his imprisonment, he spent time in “solitary confinement”, and was “whipped”. In 1858, he was imprisoned for stealing “heath”, and acquitted of the charge of “receiving stolen goods”. (These may be related to the same charge). His son Thomas, who apparently never married, was often written up in the papers, mainly for being charged with poaching. (Before I go much further, I should mention that there was another Phoebe Goff who was living in Stockland in 1851. I have virtually ruled her out as a candidate for the Phoebe who is featured in the newspaper articles to follow, as she and her family were no longer living in Stockland by 1861. In fact, they were living in Thurlbear, Somerset. The other Phoebe, born in 1849, was in fact our Phoebe’s first cousin. She was the daughter of Humphrey Goff or Newberry, who was the brother of our Phoebe’s father, George). If this is indeed our Phoebe, which it likely is, (and let’s not think about “Mary Ann” possibly being Mary Jane, gentle reader), then she may have been in the position of not being able to find work due to her criminal record. Also, she is only a “reputed” prostitute. The next year in 1871, the same year she appears in the census still living with her mother and siblings, she is again convicted for “larceny” and is sentenced to another four months in prison. Despite how far she had apparently fallen, her story has a happier outcome then might be predicted. She was nothing if not a survivor. 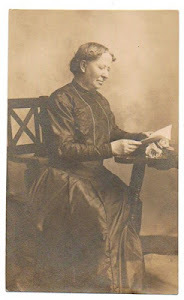 Phoebe married William Henry Drower on August 2, 1880, at the age of thirty-five, in West Derby, Lancashire, in the Parish of Walton on the Hill. It was the first marriage for both bride and groom. William, who was a stone mason, was also from Devon, but from Colyton. I do not know if they met in Devon, and then moved to Lancashire, or if they met while living in Lancashire. They ran at boarding house at 46 Canal Street in Bootle, Lancashire, and appear to have lived at this address for the rest of their lives according to census data. I can find no evidence that they had any children. Phoebe and William played an important role in the lives of my great grandfather Herbert Saunders’ family. After the death of Mary Jane, his mother and her sister, his father James is found living with the couple with his brother John and some of the children in the 1891 census. He had lost his job and home in the aftermath of his wife’s death, and his own dissipated behaviour. Phoebe had taken them all in at a very difficult time in their lives. Herbert and his brother Albert were living with their paternal grandmother in Somerset that year, and likely moved to Bootle very soon after. They appear to have also lived with their Aunt Phoebe for a time. In a family account it is stated regarding “the aunt and uncle”, who were most certainly Phoebe and William, that “after a while the burden was too great for these good people”, and the children were placed in an orphanage. (It seems that at least Herbert was also taken in at some point by Phoebe and Mary Jane’s sister Elizabeth, likely before he went to live in Lancashire with his siblings. Her married name was “Lee”, and Herbert lists “Elizabeth Lee” as his mother on his marriage certificate, perhaps because she may have been the only “mother” he ever knew). I suspect that Phoebe continued to be involved with the Saunders family, as her great niece, three-year-old Henrietta Windsor, daughter of Henrietta Saunders Windsor, is enumerated on the 1901 census as being present in her home on census night. Phoebe died in the first quarter of 1917 at the age of seventy-two in West Derby, Lancashire. My sources are all available on my public tree on Ancestry: A Hart Family Tree by 1_chart, or you may contact me for specific sources at chart5x5@gmail.com.